RIM announced on Friday the launch of BlackBerry Mobile Conferencing, a free app designed to make scheduling and joining conference calls incredibly easy. If your company routinely (or even occasionally) relies on conference calls, I can see this quickly becoming an indispensible app. The feature that most users will be the most excited about is One Click Join. When your calendar says it's time for a conference call to begin, you get a pop-up on your phone. Click a single button and you'll be dialed in, with no need to remember the dial-in number or the access code. The Mobile Conferencing app integrates deeply into BlackBerry's Calendar application, designed to make it easy to turn any meeting into a conference call without having to leave the Calendar app. You can also create recurring calls. 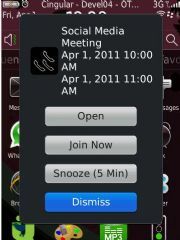 BlackBerry Mobile Conferencing's popup, with its one-click Join Now button. Other features include an easy way to reconnect to a call should you be dropped for any reason, as well as protected host codes. This means that moderator codes are kept hidden from other attendees, who only receive the information they need to join the call. The application will also automatically look for conference information in appointments on your BlackBerry from any calendar you have access to, and then integrate that into BlackBerry Mobile Conferencing, which will hopefully eliminate redundant data entry. It's designed to work with a majority of existing conference services right out of the box. However, if your company's provider of choice requires extra steps, such as pressing the star key and then entering a personal PIN, those unique steps can be stored in your conference profile. That information will be hidden from other participants, and you will still be able to use the One Click Join feature. How big of a splash will this make? It's difficult to say. The mobile ecosystem for business users is changing rapidly. RIM's BlackBerry phones are still incredibly popular among business users, but Android, iOS, and now Windows Phone 7 devices have been making a lot of headway in that department. For companies whose employees almost exclusively use BlackBerry devices, this will certainly add incentive not to change horses. For company ecosystems that are more already diverse, would this be enough incentive for a user to switch back from Android or iOS? Probably not. The Add Conference Details window affords many controls from a single screen. It's great to see an app like this offered as a native solution. Its closest competitor may be the group messaging app GroupMe, which does have an integrated conference calling feature. While GroupMe has the advantage of working across multiple platforms including BlackBerry, iOS, and Android, it is much more aimed at consumers, and isn't likely to lure too many businesses that already have conference calling solutions that they like. The BlackBerry Mobile Conferencing app is a free download that requires BlackBerry Device Software version 5.0 or higher. If you try it out, drop a note in the comments section below to let us know what you think of it.